Strawberry, along with vanilla and chocolate, are the three most popular flavors of ice cream. Although there are excellent brands of commercially made ice creams on the market, when you make your own it turns something quite ordinary into something extra special. We begin our strawberry ice cream by roasting fresh strawberries. Roasting brings out the strawberry's color and flavor, even if you are using less than perfect strawberries. Roasting entails taking fresh strawberries, tossing them with light corn syrup (can also use golden syrup, liquid glucose, honey, or agave), and baking them until the color of the berries intensifies and they soften and release some of their juices. The corn syrup not only sweetens the strawberries but, when making ice cream, it also prevents them from freezing into a solid icy block. This ice cream starts with a vanilla flavored custard. Just four ingredients are needed - cream, sugar, egg yolks, and vanilla. 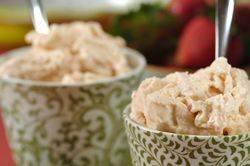 The cream gives this ice cream its rich and creamy taste. Sugar gives the ice cream its smoothness. Eggs are necessary for smoothness and color. And vanilla is for flavor. Once made, the custard needs to be throughly chilled, preferably overnight. The custard should only fill your ice cream machine about half to two thirds full. This is so the custard has enough room to expand while it freezes so you end up with an ice cream with a light texture and no graininess. As the ice cream is still soft once it has been churned in the machine, transfer it to a storage container and place it in the freezer for a few hours before serving. This also allows the flavors to mellow. Homemade ice cream will become quite hard after being frozen for any length of time so transfer it to the refrigerator to soften for about 30 minutes before serving. Roasted Strawberries: Preheat your oven to 300 degrees F (150 degrees C). Line a baking sheet with silpat. Cut the strawberries in half (or quarters if using large strawberries) and toss with the corn syrup. Place on your baking sheet and bake, stirring occasionally, until the color of the strawberries intensifies, the strawberries soften, and the syrup is nice and thick (about 30-35 minutes). Remove from oven and transfer to a large bowl. Using a potato masher or fork (can also use an immersion blender) crush the berries until you have a thick sauce with small pieces of fruit. Let cool completely. The roasted strawberries can be made ahead, covered, and stored in the refrigerator for up to a week. You will need 3/4 cup (180 ml/grams) of the roasted strawberries for the ice cream. Strawberry Ice Cream: In a stainless steel bowl beat the egg yolks and sugar until light and fluffy. You can do this with a wire whisk or a hand mixer. Meanwhile, scrape the seeds from half a vanilla bean. Place the seeds and the vanilla bean in a small saucepan, along with the half-and-half cream. Over medium high heat bring the mixture to the scalding point (the milk just begins to foam up). Remove from heat. Gradually pour the scalding cream into the whipped egg yolk mixture, making sure you keep whisking constantly so the eggs don't curdle. If any lumps do form, strain the mixture. Immediately remove the custard from the heat and continue to stir the custard for a few minutes so it does not overcook. At this point stir in the vanilla extract, if using. Stir in the roasted strawberries. Cover and let cool to room temperature and then refrigerate the custard until it is completely cold (several hours but preferably overnight). Transfer the cold custard to the chilled container of your ice cream machine and process according to the manufacturer's instructions. Once made, transfer the ice cream to a chilled container and store in the freezer. If the ice cream becomes too hard, before serving, place in the refrigerator for about 15 to 30 minutes or until softened.